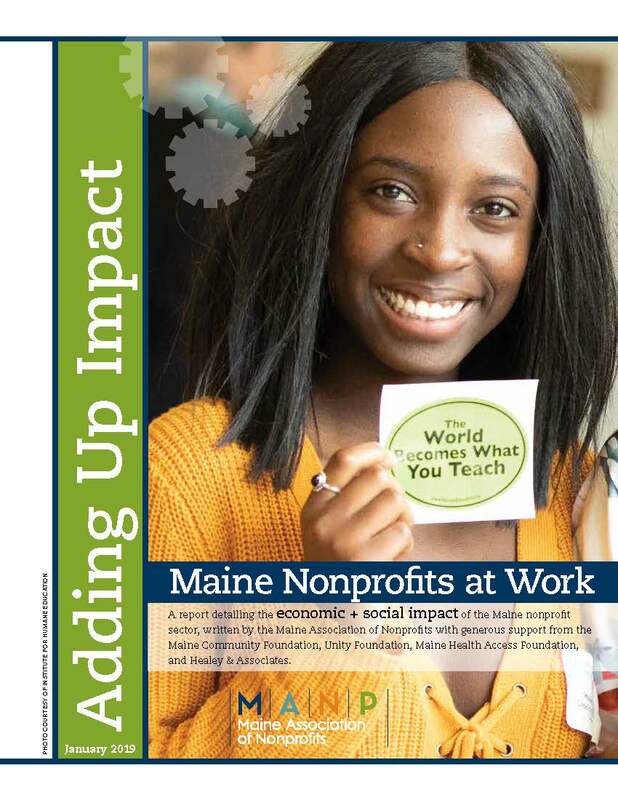 Adding Up Impact: Maine Nonprofits at Work 2019, MANP’s newest report on the economic and social impact of Maine’s nonprofit sector, illustrates how nonprofits are vital to making Maine communities better places to live, work and visit. Download a free copy of the full report. We all play a role in ensuring nonprofits work for Maine! Review our recommendations. 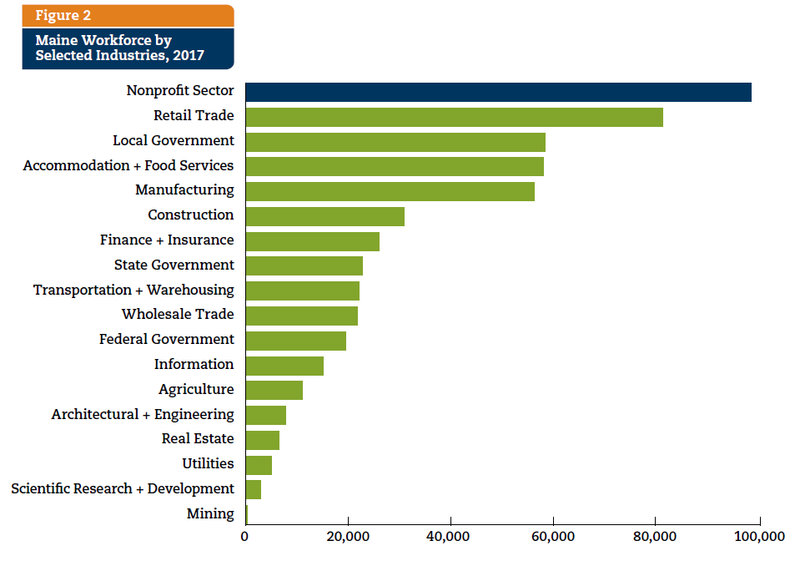 Contribute approximately $12 billion dollars per year to the economy through wages paid, retail and wholesale purchases, and professional services contracted. Pay $4.7 billion annually in wages, which translates to approximately $271 million in personal income tax revenue. Employ 1 in 6 Maine workers. That’s over 98,000 jobs! Mobilize over 420,000 volunteers per year who donate approximately $1 million of time + talent to improve Maine communities. Serve as the foundation of Maine’s creative economy, which attracts business. Partner with government to build and preserve public structures such as libraries, health clinics, parks and open space, affordable housing and emergency shelters. Provide care for the mental and physical well-being of Mainers of all ages. Conserve and protect the natural resources that are a cornerstone of our economy and quality of life. Check out our Stories of Impact profiles that illustrate nonprofits’ strong return on investment. A healthy and engaged nonprofit sector is essential to enhancing the health and economic opportunity of Maine individuals, families and communities. Each of us play a role in ensuring nonprofits continue to work for Maine. Elected officials + candidates for office: Engage nonprofits as civic leaders and authorities on issues important to voters. Policy makers: Partner with nonprofits to develop and advocate for legislation to address community challenges. Business leaders: Understand the role of nonprofits in workforce support and development, and as potential business partners. Municipalities: Strengthen communities by incorporating the work of local and regional nonprofits into economic development strategies. All Maine people: Recognize how nonprofits help stretch and supplement taxpayer dollars to improve the lives of Maine residents. Support causes you care about with time, talent, money and advocacy! Keep up to date on nonprofit news, events and opportunities through MANP's weekly e-newsletter.